The new QUATTRO series with their fast f/4 focal ratios, have been specially designed for high quality astrophotography with short exposure times. They are of course also fine telescopes for visual observations. Tube interiors have knife-edge ray traced baffles. CARBON FIBRE TUBE (QUATTRO-8CF only): Carbon fibre is a strong and lightweight material and has much better thermal stability compared to a steel tube. This is especially important for astro-photographers dealing with long exposure times. Imaging telescopes made of less thermally stable material can deviate from optimum focus after long time exposures. With a carbon fibre tube, it can remain in focus for a longer period of time and long exposure images will stay clear and in focus. 2" DUAL-SPEED LINEAR POWER FOCUSER (both models): The new linear power focuser utilises 4 precision ball bearings to support the drawtube and provide great stability and zero image shift while supporting a heavy eyepiece or camera. Moving the drawtubeby the roller rather than a rack and pinion ensures exceptionally smooth operation, great feel and precise adjustability. The dual-speed feature has a second focus knob that has a 10:1 speed reduction to provide the super-fine adjustments even the most demanding users can appreciate. "The Quattro's tube is lined with a set of nine internal baffle rings. 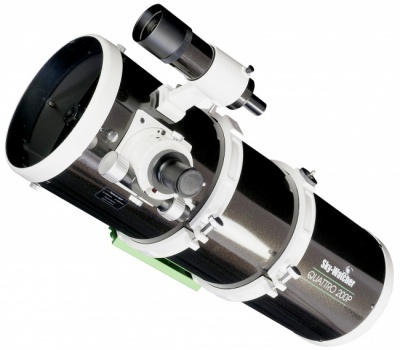 Their main purpose is to cut down on stray light entering the telescope tube, helping to improve image contrast, but they also lend a bit of extra stability to the tube structure....The Quattro-8S is fitted with a Crayford-style focuser that performed well. It has tension adjustment, focus-lock and a 10:1 dual-speed fine focusing option, and also comes with a 2-inch fitting that has a T-thread on its external side. This allows a good connection to be made between scope and camera with the right adaptor ring....Visually, the Pleiades looked like diamonds hanging in space, with a hint of nebulosity visible around the brightest star Merope. The stars were generally crisp and sharp, with good colour on show. The scope is superb for imaging too, delivering shots that appeared to have higher contrast t han the other scopes on test."